VO: We are living our life in the fast lane in search of bread and wages. Parveen Saeed, founder of Khaana Ghar: This is a story about one’s self respect. Shuja Rizvi, social worker: This is a story of determination. Anees Haroon, human rights activist: And it’s about consistency. VO: The city of Karachi and its lifestyle. It becomes difficult to feed yourself during this time of inflation. Abdullah, resident of Khuda ki Basti (God’s Dwelling): There is so much inflation. The salaries and wages of poor people like us are also very low. Note: Khuda ki Basti is a famous model low-income planned settlement for people who buy their plots of land at incremental prices. VO: Is it a dream that a person can fill his stomach by just paying Rs3/- during this time. This dream was made true by Parveen Saeed. Resident: I live nearby and I come to Khaana Ghar to eat every day. They provide food at a low cost due to generosity. I have nothing except for Allah’s help and I thank the Almighty in every situation. 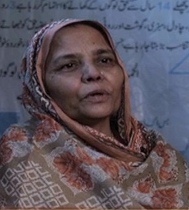 Ghafuran bibi: Not even my own relatives have taken care of me the way they have. VO: Who is Parveen Saeed? Parveen Saeed: There are problems such as hunger, frustration and distress. People suffer. These issues affect poor people. It is our struggle to feed the poor and unemployed. VO: This is Karachi’s area of Khuda Ki Basti where Khana Ghar is located. Ghafuran bibi: I came here to buy bread as I am short of flour. I buy food when I haven’t cooked it or there is shortage of gas. Abdullah: One plate of curry along with three pieces of bread can be brought for three rupees. It is enough to fill your stomach. I buy food for Rs100/- for my whole family. I am able to buy two to three curries and 33 breads. This is a four-time meal for my whole family. VO: What is the story behind Khana Ghar? Parveen Saeed: A woman killed her two children. When I asked her motive, she replied that even I (Parveen) would kill my own children if they are starving. Her answer shook me so much that I realize how grave the issue was and it needed to be addressed. I set my location and started selling food at prices that people could afford. We started off by selling food for two rupees by which a person could afford one piece of bread and a curry. As the situation went on, the price of flour sky rocketed after which the cost of food tripled. We are still thinking of reducing it to two rupees and the price will be brought down if we have more resources. The aim of token money was to keep a person’s self-respect intact. They come, sit and eat or get their food and go away with dignity. VO: Pakistan stands 107th on the list of developed countries and the ratio of people suffering from hunger has reached an alarming proportion. Many welfare organisations try to help with their own funding but the budget is not spent on tackling the issue. Anees Haroon: If we had been a welfare state, then there would be no need to feed people like this because it is the duty of the state to fulfill the basic needs of the people. It is the duty of the state to help people by providing jobs, a monthly stipend for food at low cost. Shuja Rizvi: No development work takes place despite billions of rupees being allocated in the budget. The money is not being spent on the people. Naturally, the question arises on whether we should abandon those who can’t afford the basics. We have to realize our responsibilities and do whatever we can. Parveen Saeed: We started off with two people and today, by the grace of Allah, more than 5000 people come for food every day. VO: Starvation is brutal. It has no religion. A hungry person even sees the full moon as if it were a piece of bread. Anees Haroon: When a person is hungry, he/she does not even feel human. A poet once said that hunger cannot be blended into norms and traditions. He forgets everything in this world. Shuja Rizvi: The poor are getting poor and the rich keep getting richer. The middle class is slowly finishing. It is a different thing that the state is failing to help the poor. It is up to me now to take care of them if I can afford it. Parveen Saeed: I read in a newspaper that a prime minister’s daily kitchen expense was Rs0.5 million. I wouldn’t take their name but I ask how much do they eat? They would eat just one or two breads. Allah would give them more if they would collect that sum and provide employment opportunities to the needy. This doesn’t happen here. The people here are wasting their wealth. Shuja Rizvi: It is such a good thing that a person and his entire family is able to eat food by paying such low prices in a city where a single piece of bread costs Rs12. Parveen Saeed: If Allah has given us this duty it is also necessary for us to nominate one person and teach him how to carry forward this mission. There are many good people in this world who realise that the work must continue. VO: Khaana Ghar has become the identity of Khuda ki Basti. Parveen Saeed: A person only remains human till there is humanity in him. Your character defines what you do. There are many “angels” in this world but Allah choses specific persons to do His good in this world. VO: People don’t feel ashamed while coming to Khaana Ghar for food. Parveen Saeed: Alhamdolillah the work is going on. Khaana Ghar is feeding the hungry on the front and is sheltering abandoned children, playing its role in the treatment of patients, paying the fees of schoolchildren and other small things on the back end. We are not a very big organisation but we will continue our mission till the day we die.